Purpose: To memorialize the veteran B-47 Aircraft as the vanguard of America's strategic nuclear deterrent during the cold war. The B-47 MUST NOT be forgotten. Background: Lt. Col. Charlie Brown, USAF(ret) was the founder. He collected over 360 names and set up a committee to organize various activites, such as collection of historical information and to plan a reunion. Charlie died following surgery in the fall of 1996, but his dream carries on. The Association is now organized with a full slate of officers. 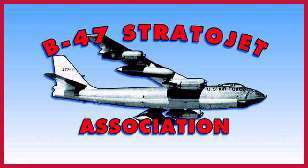 The first B-47 Association Meeting was held in Omaha Nebraska, May 21-24, 1998. Activities included a tour of the new SAC Museum, briefings at the United States Strategic Command Center at Offutt AFB, seminars, and a closing banquet. To view photos of the B-47 Association 1998 Meeting, click here. The second Association Reunion was held in Midland Texas in October 2000 at Midland Texas, in conjunction with the Confederate Air Force Year 2000 Air Show. Next reunion was held in Seattle Washington area in Fall of 2002.2004 reunion was held in Dayton Ohio and the 2006 reunion was held in Wichita Kansas. This page was last updated on 4 August 2007.